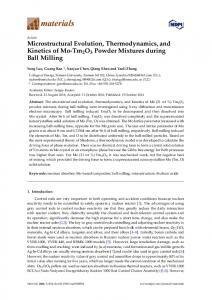 Dec 27, 2005 - arXiv:physics/0512252v1 [physics.class-ph] 27 Dec 2005. 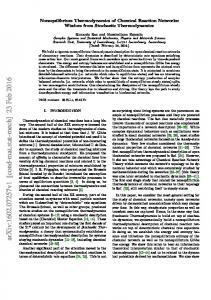 Nonequilibrium Statistical Mechanics and Thermodynamics from Darwinian. Panin V.E. * and Egorushkin V.E.. ISPMS SB RAS, Tomsk 634021, Russia. Received 15 April 2009; revised 24 April 2009; accepted 28 April 2009. Abstract. Aug 21, 2009 - Hans Christian Ãttinger* ... In 1967, Waldmann 2 made a first step to describe ... extended the work of Waldmann and included the thermody-. 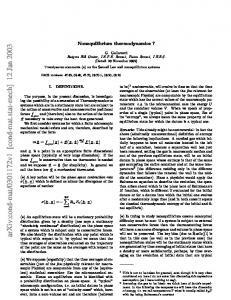 Sep 22, 2009 ... the preceding paper on the nonequilibrium thermodynamics of systems with ... sential ingredient in theories of nonequilibrium phenomena. built on Lyell's application of the paradigm to geological phenomena by attempting to demonstrate that no appeal to a non-physical agent need be invoked to explain the intricate functional unity obtaining within organisms and between organisms' and their environments. By doing away with the assumption that Mayr has called "essentialism" - namely, the principle that changes in organic lineages are constrained by a set of inherent limits to such change - Darwin was able to treat each organism as an independent center of an inherent tendency toward selfpreservation; and, by way of a complex argument, to go on to conclude that organic lineages, when they do not go extinct, maintain a dynamic equilibrium with a continuously changing environment by taking up and passing on heritable variations that are eufunctional with respect to a given environment (Mayr, 1977). Neo-Darwinism is not the same theory as Darwin's, but its claim to be a mature science rests, at the conceptual level, on its ability to more clearly project its own conformity to the Newtonian paradigm than its parent theory. Mendel's Laws, amplified to the populational level by way of the Hardy-Weinberg Equilibrium formula, state how genetic variants will be distributed in an interbreeding group when members of that group remain unaffected by a variety of exogenous forces. Without such forces, the state of the system - the proportional distribution of genetic variation in a freely interbreeding population -will remain the same. As heritable variation occurs and is distributed in accord with Hardy-Weinberg ratios, the effect of the various forces that operate on it can be measured against a presupposed "zero-state," as forces in a Newtonian system of bodies can be m~asured against the zero-state of his Second Law. Elliot Sober has recently argued, in fact, that the coherence and power of the Darwinian tradition, as well as the resolution of its current problems, comes into view only when it is thus seen as a theory of Newtonian forces: The zero force is specified by the Hardy-Weinberg Law ... If no evolutionary forces act, then the frequencies of genes ... will 'be the same as their frequencies in the organisms of the previous generations ... Once genotypes have gone to their Hardy-Weinberg Equilibrium values, there they stay, in the absence of an evolutionary force .... The theory then specifies what effect each possible force will have (Sober, 19'84 : 31). mental considerations, was exaggerated. This is now changing. From this perspective it is evident that there are constraints on the source and effects of variation just because the genome is hierarchically structured. The Darwinian hypothesis that evolution is a long-run outcome of natural selection is reasonable, then, just to the extent that these forces work, like a "tinkerer" (Jacob, 1982), on truly random variation that can be taken up into organic systems that are phenotypically decomposible into separate parts. But to the extent that constraints operate on the production of variation and on its level of fixation, we begin to understand that biological systems may not be as readily fragmented as we had thought, and that their evolutionary relationship with the environment is a complex, mediated one. If this is true, we arrive again ata conclusion already mtimated: The course of evolution will not be a direct function of microevolutionary processes. Long range trends will be determined more by what variation is initially given and by what constraints serve to channel it. Thus the mere fact that every macroevolutionary effect had to have been the product of microevolutionary process does not entail that all macroevolutionary problems can be successfully answered by reference to these processes. Some questions might be answered more securely by bypassing the detailed working· of microevolutionary processes a.nd looking at the constraints that chann1el it. In a sharp departure from the received philosophy of science, which identifies explanations with deductions from laws, it is now commonly acknowledged that what counts as a good explanation is directly dependent on what sort of question it responds to. The kinds of questions proper to microevolutionary studies might well regard constraints on variation and selection and other like forces as interferences in the smooth reordering of gene frequencies. But the kinds of questions proper to macroevolutionary studies might require us to treat what micro evolution regards as interference as the proper causes of pattern over time. Successful explanation is a matter of measuring the real against the expected; and what is expected is largely a function of the expectations conceptually built into the theories we are using (See Garfinkel, 1981, for an incisive defense of the "relativity of explanations" and a demonstration that "structural explanations" are the only appropriate answers to some kinds of" questions, questions, that cannot be addressed properly by consideration of underlying "micro" causes). A move in this direction has been made by proponents of "punctuated equilibrium" patterns in macro-evolutionary kinetics, notably S. J. Gould-. Gould argues, we recall, that paleontology does not support a pattern of gradual change such as that predicte~, or assumed, by the atomistic approach to traits characteristic of the Darwinian tradition. -Rather, we see long patterns of stasis interrupted occasionally by periods of rapid morphological change. Gould has gone on to suggest that these facts accord better with the stress on constraints now coming from molecular genetics. He sketches an explanatory dynamics for this kinetic pattern in which sudden reorganizations in the regulatory system of the genome produce spciation prior to adaptation, followed in _tum by selection among the resultant species (rather than -among variant individuals within a species), the survivors of which winnowing-process settle down once again into long-range morphological stasis governed by internal constraints (Gould, 1982a, b, c). In the course of defending this view -Gould has articulated the idea of-an "expanded synthesis". (Gould, 1982a); He does not argue that ev~iution has to proceed according to his ','punctuated"model; nor does he deny· that some cases of -speciation and subsequent phylogeny can be explained in terms of the extrapolation of combinations of micro-evolutionary forces, such as drift and organismic selection. His point isthat a wide variety of models ought to be' constructed, and that experience in applying such models will show overtime that some are presumptively (though defeasihly) more useful for certain. types of problems and processes than others. Thus further success in evolutionary biology will depend on adamant refusal to push all evolutionary problems into the procrustean bed prepared for them by the classical assumptions of the Darwinian research tradition, by .the preferred models of Neo-Darwinism, and by the effort- to philosophically transform the latter into a definitive and complete theory of evolution. I will return to the methodological significance of these proposals at the end of this paper. What is important now is to see that Gould's insistence that his version of an expanded synthesis stays within the Darwinian _research' tradition is well taken. Though natural selection working on separate organisms will be an important part of the causal story in only a limited number of cases, natural selection itself remains conceptually at the center of -Gould's proposal. Selection can operate at various levels - genes (in the sense of replicative stretches of DNA), cells, organisms, demes and ,species. and Wiley's own view is both in relation to classical selectionism and in relation to other accounts possible within a generally nonequilibrium framework. While the theory advanced by Brooks and Wiley relies, like Wicken's, on the notion of an inherent, timeirreversible build-up and dissipation of variation, and hence entropic disorder, in genetic systems, Brooks and Wiley treat the accumulation of variation, together with the existence of constraints on genetic decomposition, as a sufficient cause of evolution rather than as a necessary condition. Wicken makes liberal use of the part-whole relation to bring the presuppositions' of both energetic and informational entropy to bear upon contexts of inquiry that continue to rely on the notion of selection, particularly for thermodynamic efficiency, as proper' cause. Non-equilibrium thermo., dynamics grants the background presumption that makes these causal explanations go through .. It does not in itself provide the explanation. Brooks and Wiley make no such use of part-whole relations, treating non-equilibrium thermodynamics in a highly abstract,formulation as the cause of the accumulation and dissipation of information. This require's them to· argue on two fronts. 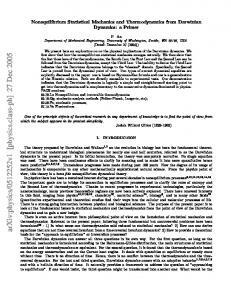 They must oppose both the equilibrium models of Neo-Darwinism and the nonequilibriuID: inodels of. their rivals'~ They do so by ascribing the same error to both: reliance on external' causation or environmental determinism. In doing so they do not, however, display their best arguments. Prigogine's work.has given rise to a conceptual distinction between "initial conditions models," which apply to systems under the control of their own history, and "boundary conditions" models, whch describe systems strongly, under the influence of the synchronic forces to which they are subject at any given time. Brooks and Wiley tend· to think that Neo-Darwinists as well as Prigogine and Wick en have "boundary conditions models" and that they alone have a robustly "initial.conditions" model, in which the state of any species, considered as' a system, is a function of its own genetic history, .independent· of .environmental contingencies, against which species are buffered by 'their genomic integrity. It is not that Brooks and Wiley think' that environme.ntal, energetic conditions have no role, as necessary conditions, in allowing ·such systems to eXist and evolve through time. Rather, they think that energy requirements for running these systems can be taken as a given and, in effect, a constant over all species, so that mentioning them as causal and explanatory considerations is improper. has a peripheral but real effect on the rate of speciation, they are saying either too little or too much. If this is consistent with the claim that entropies alone drive speciation, it says too little. But if it is taken at face value it seems to imply that the causes of rate change in speciation may enter into the total causal account that assigns weight to considerations coming from different levels. The robustly realistic sense of biological complexity that Brooks and Wiley profess, and often exhibit, will lead in the latter direction. But in this case it becomes all the more likely that there is no direct path down the deductive slope from thermodynamics to systematics. These ambiguities are most apparent at the methodological level of Brooks' and Wiley's argument. They argue for their deduction of phylogenetics from thermodynamics by speaking of explainmg phenomena by deducing them from laws plus auxiliary conditions (Brooks and Wiley, 1986: Preface). In this view they responsor the received view of the structure of scientific theory and its account of explanation as deducibility from laws. They treat this as equivalent to the notion of causation. But, as we have seen, explanations generally and causal explanations in particular are highly context dependent affairs, and an appreciation of the complexity of biological systems .is not likely to diminish out acquiescence to that context-dependence. Thus an appreciation of the complexity of the biological hierarchy is likely to be at odds with the received view of the philosophy of science. That view may help Brooks' and Wiley's phylogenetic project, but is SUbstantively at odds with other interesting components of their work. This point could be pressed a bit further by suggesting that the notion of cause as deducibility from law is applicable only to Newtonian systems, out of consideration of which it surely grew. Newtonian systems are closed systems', and only such systems have tight enough closure conditions to make a deduction into a cause (Cf. Dyke, 1984). 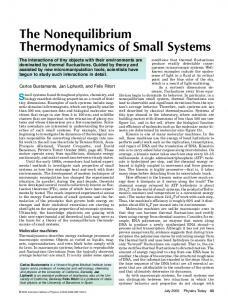 Nonequilibrium systems, by contrast, are radically open systems. It may well be inappropriate, then, to apply traditional philosophy of science to them. But without the introduction of such closure conditions it becomes difficult to see how Brooks' and Wiley's conclusio!1s about systematics can follow from their basic principles. The conclusion of the above arguments is that Brooks'and Wiley's initial and sustained concern with providing an evolutionary grounding for phylogenetic systematics inclines them toward too straightforward a deductive relationship between their thermodynamic-informational premises and their phylogen.etic conclusions. law, considered as general facts, but at the level of explanation of complex particulars. A number of philosophers of biology whose substantive commitments are to some version or another of Neo-Darwinism ,have also been attracted to these notions, not only because of the difficulties attendant upon attempts to find the basic laws in biology (some of which we reviewed above in connection with the status of _ the Hardy-Weinberg formula), but also because of the complexity that biological systems exhibit (Beatty, 1980; Brandon, 1978). Levins' notions of "robustness" go even further under the impact of the recognition of complexity (Cf. Dyke, 1985). If these methodological ideas were to carry the day it would signal -a potentially major shift in the scientific self-image of contemporary culture. But many scientists, as well as orthodox scientistic philosophers, are more likely to see in methodological puluralism, and in the call for an "expanded synthesis ," only confessions of weakness, signs that an old paradigm is comirig apart because it cannot find laws to deductively cover cases. On this view methodological pluralism blurs the line between science and nonscience by using respect for complexity to disguise the possibility that a 'research tradition, in this case Darwhlism, is in a degenerative phase. Metho9.ological pluralism, that is, -gives vice the appearance of virtue, and possibly retards the progress of science. -Rather than pursuing such --a -line, then, evolutionary biologists should redouble their efforts to find the appropriate -laws of nature from which the phenomena they seek to explamcail be deduced, in conjunction with appropriate initial and boundary conditions. As a working rule, the la ws that will succeed will be closer to those of physics than previous candidates, in accord with the-expectations of the unity of science program and the previous sUccess of reductionism. It is easy to think of Brooks' -and Wiley's proposal in this light. There are, however, difficulties in their theory that appear when this is done, as -we have seen. It does not follow, however, that their theory should be rejected., We will do-well, I believe, to acknowledge the call for a switch to non~quilibrium background principles in evolutionary _science, and to move as far -beyond Newtonianism- as possible in tiie light of the current prospects for new insights. What should be rejected is the hypothetical deductivism in which Brooks and Wiley have -cast their theory, a philosophy of science too closely connected with the very world-picture they wish to move beyond. evolution" in Evolution at a Crossroads. edited by Depew, D. and B. Weber. MIT Press/Bradford Books, 1984. COLLIER." John, (1985) . "Entropy and evolution". Philosophy of Biology 1. CRACRAFT, J., (1982), "A nonequilibrium theory for the rate control of speciation and extinction and the origin of macroevolutionary patterns". Syst. Zool. 31 (4), 348-365. DOVER, G., (1982), "Molecular drive: a cohesive mode of species evolution". Nature 299, 111-117. DYKE, C., (1984), "Complexity and closure." In: Evolution at a Crossorads. edited by Depew, D. and B. Weber, MIT Press/ Bradford Books, Cambridge, Mass. ELDREDpE, N. and S.J. GOULD, (1972),- . 'Punctuated equilibrium: . an alternative to phyletic gradualism." In: Models of Paleobiology, edited by Schopf, T.J.M. W~H. Freeman, San Francisco. GARFINKEL, A., (1981), Forms of Explanation. Yale University Press, New Haven, Conn. GHISELIN, M.T., (1974), "A radical solution to the species problem." Syst. Zool. 23, 536-544. GIERE, R., (1979), Understanding Scientific Reasoning. New York: Holt, Rinehart, and Winston. GOULD, S.J., (1982a), 'Darwinism and the expansion of evolutionary theory." Science 216, 380 - ·386. GOULD,- .8...J., (1982b), "The meaning of punctuated equilibrium and its role in validating a hierarchical approach to macroevolution." In Perspectives in Evolution, edited by Milkman, R. Sinauer, Sunderland, Mass. GOULD, S.J., (1982c), "Change in developmental tuning as a mechanism of macroevolution." In: Evolution and Development, edited by Bonner, J. T. Springer Verlag, Heidelberg. GOULD, S.J. and N.Eldredge, (1977), "Punctuated equilibrium: the tempo and mode of evolution reconsidered". Paleobio. 3, 115-15L GOULD, S.J. and R.C. LEWONTIN, (1978), "The spandrels of San 'Marcoand the Panglossian paradigm: a critique of the adaptationist program." Proc. Roy. Soc. Lon. B 205,' 581598. Reprinted in Conceptual Issues in Evolutionary Biology, 1984, edited by Sober, E. MIT Press/Bradford Books, Cambridge, Mass. HENNIG, W., (1965), "Phylogenetic systematics", Ann. Rev. Ent. STANLEY, S., (1975), "A theory of evolution above the species level". Proc. Nat. Acad. Sci. 72, 647-650. STANLEY, S., (1979), Macroevolution: Pattern and Process. W.H. . Freeman, San Francisco. STEBBINS, L. and F. AYALA, (1981), "Is a new evolutionary synthesis necessary ?" Science 213, 967-971. STEBBINS, L. and F. AYALA, (1985), "The evolution of Darwinism" , Sci Am. . SUPPE, F., (1972), "The search for philosophic understanding of scientific theories." In: The Structure of Scientific Theories, edited by F. Suppe. Urbana: University of Illinois Press. SUPPES, P., (1967), "What is a scientific theory ?" In: Philosophy of Science Today, edited by S. Morgenbesser. New York: Basic Books. WICKEN, J.S., (1979) ~'The generation of complexity in evolution: a thermodynamic and information-theoretical discussion, . J4 Theor. Bio. 77, 349--365. WICKE,N,J. S., (1980)~ "A thermodynamic theory of evolution". J. Theor. Bio. 87, 9-23. WICKEN, J.S., (1983), "Entropy, information· and nonequilibrium evolution". Syst. Zool. 32, 438-443. WICKEN, ~.S., (1984a), "Autocatalytic cycling and seIf-organizatin in the ecology of evolution". Nature and System 6, 119- . 135. WICKEN, J.S., (1984b)~ "The cosmic breath: reflections on the thermodynamics of creation". Zygon 19, 487-505. WILEY, E.O., and fiR. BROOKS, (1982), "Victims of history: a nonequilibrium appro'ach to evolution". Syst. Zool. 31~ 1-24. WILEY, E.O.and D.R. BROOKS, (1983), "Nonequilibrium thermodynamics and. evolution :a response to Lovtrup". Syst. Zool. 32, 209~219. WILSON, A.C.; S.CARLESON, and T. J. WHITE, (1977), "Biochemical evolution". Am. Rev. Biochem. 46, 573-639. 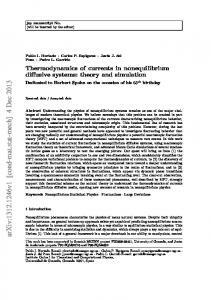 Report "27 NONEQUILIBRIUM THERMODYNAMICS AND EVOLUTION: A ..."